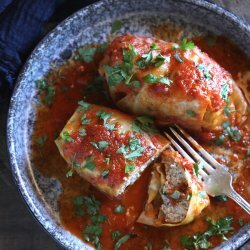 This keto stuffed cabbage in the Instant Pot is not only easy and delicious, it’s also dairy free, nut free, SCKC and Whole 30 friendly! Cut the core out of a large head of cabbage. Remove any discolored or damaged leaves from the outside. Place in a large bowl, stem side down with 1 cup of water in the bottom. Microwave, covered, on high for 8 minutes, or until the outer leaves are softened and turning translucent. Remove and cool before carefully separating leaves for use. Place all of the filling ingredients in a large bowl, and mix well with your hands until fully combined. Combine all of the sauce ingredients in a large bowl and stir well. Store extra sauce in the fridge or freezer. Place 1/2 cup of sauce on bottom of Instant Pot insert. Place a cabbage leaf on a clean flat surface and add 1/2 cup meat filling to the center. Fold the two sides over the meat mixture, then roll from the edge closest to you over the meat mixture until a small rolled bundle is formed. Repeat with three more rolls. Top the rolls with 1 cup of sauce. Place a cabbage leaf on top of the rolls to keep them separated from the next layer. Make the remaining 4 rolls and place on top of the cabbage leaf. Do not press down. Cover the top of the cabbage rolls with another 1 1/2 cups of sauce. Place the cover onto the Instant Pot and lock in place. Make sure the vent is closed. Choose Manual / Low Pressure and set it for 20 minutes. When the timer goes off, allow the pressure to release naturally – about 10 minutes. Remove the lid and serve hot with extra parsley for garnish if desired. Store leftovers in an airtight container in the refrigerator for up to 5 days, or the freezer for up to 3 months. Spread 1 cup of sauce in the bottom of a 9 x 13 baking dish. Place a cabbage leaf on a clean flat surface and add 1/2 cup filling to the center. Place the roll in the baking dish. Repeat with the remaining 7 rolls. Top with another 2 cups of sauce, distributing evenly over the cabbage rolls. Serve hot with extra parsley for garnish if desired. This recipe can easily be doubled if you have an 8 quart Instant Pot!